Our Perfection latex mattress offers progressive softness which delivers the ultimate sleep experience with layers of both soft and medium natural latex comfort layers which are placed above our exclusive 5-zone performance core. 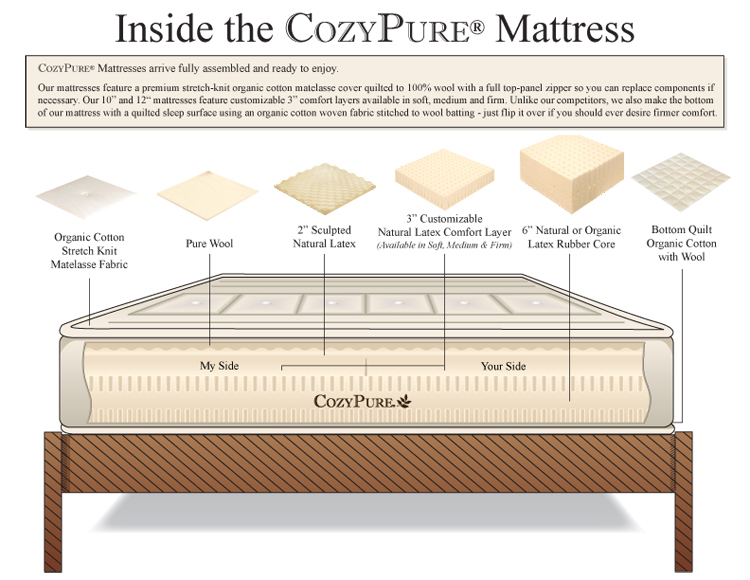 Starting with our 5-zone core as the ever-critical support foundation, we then top it off with a 3" medium-soft layer of latex and then above that we place another 2" sculpted latex for a mattress that welcomes you with gradual softness, yet doesn't compromise support. On the surface: We start with our signature Quilting which features 100% pure wool under soft organic cotton circular stretch knit matelasse fabric. The Cozy PERFECTION features a 3" layer of medium-soft latex above the core and top it off with another layer of 2" sculpted latex on the surface for extra cradling comfort and exceptional cushioning, without sacrificing the proper support your body needs. #1 - Add another small layer ( 1" or 2") of soft latex. This provides a touch more softness. #2 - For folks that want plush luxury, consider adding our Natural Latex LaNoodle Cuddle Top. #3 - You can also combine both #1 and #2 -- add another soft layer of latex PLUS add the Cuddle Top (this will deliver the most luxurious soft mattress configuration we offer). #4 - Interchange the layers for a different feel (put the 3" on top, or flip the sculpted layer, etc) - call for details. #5 - If you should ever desire the Cozy Perfection to feel firmer, simply flip it over, or you can interchange the layers. Call us for details.